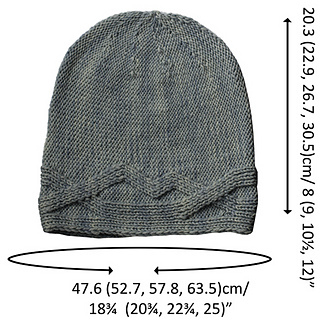 Instructions are provided to make a hat in 4 different circumferences – 47.6 (52.7, 57.8, 63.5)cm/ 183⁄4 (203⁄4, 223⁄4, 25)” - and 4 different depths – 20.3 (22.9, 26.7, 30.5)cm/ 8 (9, 101⁄2, 12)” - are available for each circumference. 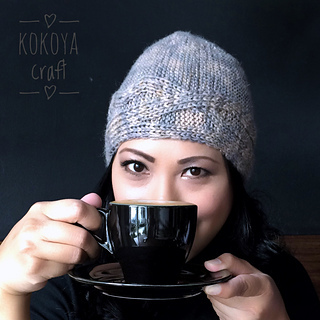 Come join us at for all the inspiration, chat This hat features a unique cable that asymmetrically intertwines with the brim, evoking a mountainous horizon, maybe even a river or lake. 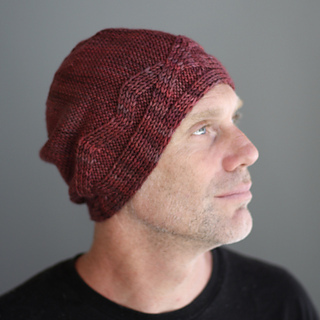 Instructions are provided to make a hat in 4 different circumferences – 47.6 (52.7, 57.8, 63.5)cm/ 183⁄4 (203⁄4, 223⁄4, 25)” - and 4 different depths – 20.3 (22.9, 26.7, 30.5)cm/ 8 (9, 101⁄2, 12)” - are available for each circumference. 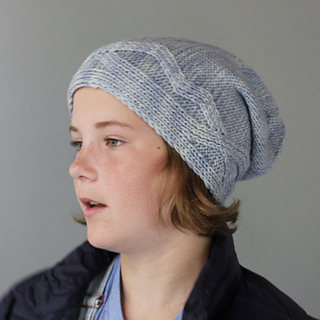 You can make it as slouchy (or not as slouchy) as you want! Tools: 4.5mm/US7 needles or size to achieve gauge, crochet hook, scrap yarn, 2 stitch markers, cable needle, and tapestry needle. 20 sts/27 rows = 10cm/4” in pattern. T2lp – P into back loop of second st on left hand needle, k into first st on left hand needle, drop both sts from left needle; on the next row (WS) p the 1st st and k the 2nd. T2rp – K into front of second st on left hand needle, p into first st on left hand needle, drop both sts from left needle; on the next row (WS) k the 1st st and p the 2nd.